In the age of the Internet, fans don’t usually catch movie trailers for the first time in theaters, especially when it comes big tentpole pictures. Instead, they catch them online, and YouTube is the most popular destination to check out the latest previews. As with any YouTube video, viewers are free to leave their opinions of these previews via the comments or the like/dislike buttons. It’s the latter feature that just set a new record for the site, as the trailer for this summer’s Ghostbusters movie is officially the most disliked trailer on YouTube. The numbers don’t lie, as ScreenCrush reports that the first trailer for the Ghostbusters reboot has accumulated 507,610 dislikes on YouTube. Just to be clear, this is a ridiculously high number. To offer a few comparisons, the article notes that the trailer for last year’s Fantastic Four reboot currently has 20,175 dislikes, while the trailer for Adam Sandler’s Netflix comedy The Ridiculous Six, which was panned across the board, only has 5,803 dislikes. The Ghostbusters trailer is also the only movie trailer to crack YouTube’s Top 100 most disliked videos, although movie-wise, the list also includes two versions of Frozen’s hit song "Let It Go." In case you missed the Ghostbusters trailer the first time around or want to rejudge it for yourself, you can watch it below! Ever since the cast for the Ghostbusters reboot was announced in 2014, there’s been a lot of hate directed towards the movie, whether it’s folks who believe the movie shouldn’t have women leads or wanted it to exist in the same continuity as the original two movies. However, following the release of the trailer itself, many have criticized the preview for its supposed poor humor. Still, even with all these dislikes, the trailer has received nearly 29 million views on the main Sony account, so it’s still getting a lot of publicity. Besides, there are plenty of moviegoers who are looking forward to this release, so this "dislikes" report is unlikely to be indicative of how the movie will actually perform, especially under the direction of Paul Feig, who’s proved himself with hits like Bridesmaids and Spy. Using the same premise as the original 1984 movie, the new Ghostbusters follows a group that develops ghost-capturing technology and is the only hope of keeping New York City safe from paranormal threats. 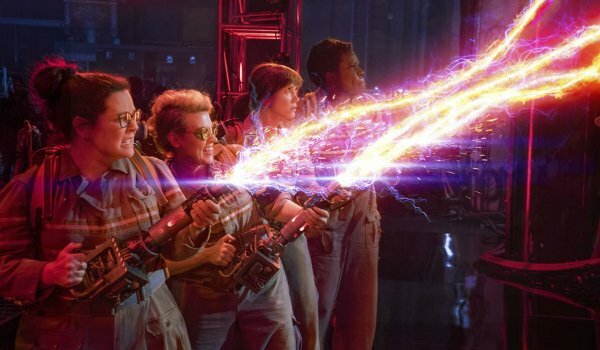 The movie stars Melissa McCarthy as Abby Yates, Kristen Wiig as Erin Gilbert and Kate McKinnon as Jillian Holtzmann, and the three scientists are later joined by Leslie Jones’ Patty Tolan. Also appearing in the movie are Chris Hemsworth as Kevin the receptionist, Neil Casey as the demon Rowan, Andy Garcia as the mayor of New York City, and will also feature cameos from many of the original Ghostbusters actors. The Ghostbusters reboot hits theaters on July 15. We actually were lucky enough to visit the set of the new Ghostbusters movie, where we learned a TON of secrets about the movie’s plot, it’s jokes, and its main villain. It makes the new movie sounds great, so read on to hear about all the amazing things we learned. Last summer, we traveled to Boston to interview Paul Feig and the ladies in the new Ghostbusters cast. We learned a ton about the plot, the finale in Times Square, and the way that the new movie plans to use Bill Murray, Dan Aykroyd and the original members of the Ghostbusters squad. Click Here To Read 10 Ecto-Cool Facts We Learned On The Set Of The New Ghostbusters! And director Paul Feig told us if the two teams – the new one and the old one – could ever meet and team up courtesy of a Multiverse System.